The biggest show on earth made an astonishing comeback Sunday as North Korea put on its all-singing, all-dancing propaganda display, the ‘Mass Games’, for the first time in five years. It was made up of 17,490 children turning the coloured pages of books in sequence to create giant images rippling across one side of the stadium — an analogue version, on a giant scale, of a usually digital solution. They portrayed scenes from floral landscapes to portraits of late leaders Kim Il Sung and Kim Jong Il, interspersed with slogans including “We can win if we defend socialism” and “Our motherland is the strongest because of the Marshal” — a reference to Kim Jong Un, the third generation of his family to rule the country. 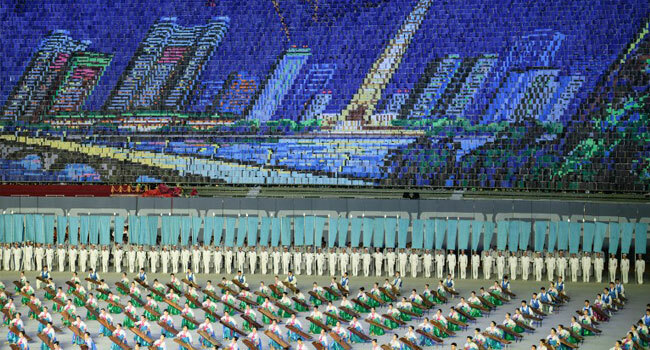 The crowd — the stadium is said to hold 150,000 people — erupted into cheers as Kim entered for the premiere of the new Mass Games, titled “The Glorious Country” and part of the celebrations for the 70th anniversary of the founding of the Democratic People’s Republic of Korea, as the North is officially known. On the covered pitch, dancers twirled, acrobats leaped, and brass bands played in a sequence of acts including “Our socialist homeland” and “We have the greatest Party”. Performers are largely schoolchildren and students but ranged from child gymnasts to a 69-year-old player of the kayagum, a traditional Korean stringed instrument –- accompanied by 1,200 others. “There’s nothing like it, no one else can do it,” said Simon Cockerell, general manager of Koryo Tours, the market leader for Western tourism to the North, who has seen several mass games. In keeping with the nuclear-armed North’s efforts to minimise militaristic elements of the celebrations — it did not put ICBMs on show at a military parade earlier Sunday — the themes focused on development and prosperity, and even a Korean War section made no overt reference to the US. At one point in an act on the reunification of the peninsula, which has been divided by the Demilitarized Zone since the conflict stopped in 1953, footage of Kim’s April summit with the South’s President Moon Jae-in was played — prompting the unusual sight of tens of thousands of North Koreans applauding images of Seoul’s leader. Practices ran for months ahead of the show, with the sound of rehearsals echoing across the city in recent nights. The commitment required from participants is enormous. Former performers say they trained from 9 am to 6 pm every day for several months ahead of the performances, bringing their school or university studies to a halt. There is undoubtedly an economic cost in devoting so many resources to an artistic show, but Cockerell said: “There’s prestige in performing in the Mass Games. For many, performing in front of the country’s leader is a high point of the experience. But Kim Jong Sun, 33, missed out. Now a production line worker at a silk factory in Pyongyang, she was a drummer in the 2008 Mass Games, but the then-leader Kim Jong Il was unable to attend any of the shows. “It was the biggest dream of my life to perform in front of the Great Leader,” Kim told AFP.